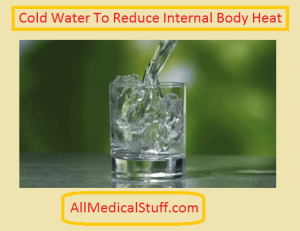 How to reduce Internal body heat with natural stuff? One of the very major health issues that occurs only because we got outside in sun is body heat. People have got to work for which it is necessary to step out of home but sun sometimes proves to be an enemy. Now when our body gets exposed to high temperature more likely around 36.5 to 37.5, we would probably get body heat or body stress. Now since we can’t just stop going outside and stop working, we need to look out for some medical solutions for the problem. I did some good research and managed to make some easy and home remedies that would help you get rid of this heat stress problem. So are you prepared to know how to reduce internal body heat? Ok then let’s get started with an easy health guideline on how to tackle heat stress problem. Whenever you reach home from work or school and it is summer, make sure that after you dry out your sweat, go for some cold water. You could drink 2 or 3 glasses of clean water. You can also take bath with the cool water. The thing you got to keep in mind that wait for some time for sweat to dry because drinking or taking bath with sweating body could cause worse health problems. Take easy breath while sitting on your sofa for at least 10 minutes so that sweat dries out. You can also dry out sweat with a clean towel. Once being done with that, open your fridge and drink 2-3 glasses of heavenly cool water. Bath is a better solution and you can get rid of this heat stress or body heat problem within a matter of an hour. De-hydration is an enemy so keep drinking some cool water after every 15 minutes to keep your body cool and away from heat. Who doesn’t know about coconut? We all love it for its sweet and cool water. We also love eating it but here to resolve the body heat issue, we got to remain concerned with its water. 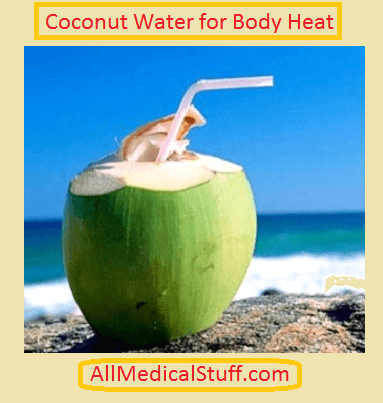 People of sub-continent especially Indians are well familiar with this coconut water since it is a common drink on shops and stalls during summers. Now for heat exhaustion, make sure that you keep some really cool coconut water in your refrigerator during summer. Whenever you reach, just take a glass of it and it will start its work against all the heat that has invaded your body. It is generally considered as a better solution because drinks like these are less harmful, have further health disadvantages and help in the reduction of body temperature more than well. It is an amazing remedy for dehydration and is not very expensive either, so we can say it is a great friend of humanity. 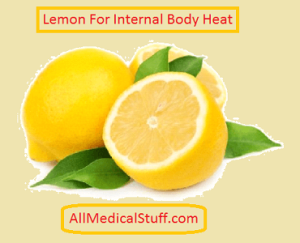 Lemon is known for its amazing health benefits and as an Assassin against dehydration. Make sure that Lemon is a part of your regular diet because it is a great fighter against body temperature and is also very good for heart related issues. Vitamin C is what makes it even better. Vitamin C enhances the temperature fighting abilities of lemon and it is rich with it. It makes oxygenation rapid and regular which keeps you energized. With lemon in your daily routine, you can remain 100% healthy and good health is a ticket to have awesome summer vacation. So what are you waiting for? Go to vegetable market and bring this yellow little natural diamonds that could prove your biggest weapons against the heat stress problem. Here is a very good recipe to use lemon since you just can’t eat it like whole. Take a cool glass of water and squeeze half or so lemon in it. A teaspoon of honey and then a pinch of salt will be more than enough to make a drink. It is always good that you drink 3 glasses a day at least. In summers, whenever I reach home from college, all my eyes look for are beautiful cut pieces of red and cool watermelon that is kept in refrigerator by mom. And not just I but all of us love to have this red and cool pieces of heaven in summers. 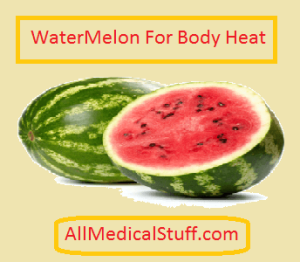 How does watermelon help in the reduction of body temperature? Watermelon has got high quality of water in it. Research says that almost 80% of the content in watermelon is water. This amazing fruit works as a potent detoxifier and washes out the toxic materials from the body which reduces the up rise of useless heat in body. It is an amazing client for hydration so you can rely on it for all summer problems. What are the best ways to use watermelons? Easiest way with the help of which you can use watermelon is to simple cut some cool pieces of the fruit and eat it. Another way is to make a sweet drink by adding slices of watermelon in milk and some sugar to make a body refreshing drink. Use of green Aloe Vera is another amazing home remedy to deal with the heat stress problem. It’s cooling, soothing and temperature fighting properties makes it one of the biggest option in the reduction of body heat. There are various other uses of Aloe Vera as well which includes the treatment of hamstring, bones weakness and many others. Here we are only talking about its use in the reduction of body temperature so we have got to stick with it. 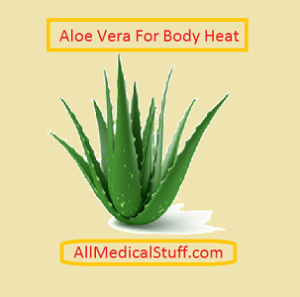 How to use Aloe Vera to reduce body temperature? First and most easy way is to take some Aloe Vera and rub it on your body and leave it for 20 minutes. As soon as the 20 minutes pass, take a bath with cool water and repeat the process every day. A drink of Aloe Vera made with the help of its gel could also prove very useful way in the treatment of your body heat issue with the help of Aloe Vera. Was this article helpful? Let us know in your feedback and keep visiting our site for more stuff on health issues. Thanks for your valuable post here. You have pointed some good resource which is very effective to reduce body heat. In Summer time I have a lot of body heat problem. After returning home from my office i usually drink cool Watermelon and Sugarcane juice then take some rest for sometimes and then take a bath. This way is very helpful for me to reduce my body heat. Thnx again for your valuable information.